Spring is finally here! Every year around mid-March I hit a wall where I'm tired of heavy winter foods. I crave brighter colors and fresher flavors. This afternoon I went to my favorite place on earth, aka Wegmans, and strolled past the seafood and meat counters, not particularly moved by anything I saw. What I really wanted was a huge bowl of vegetables. During the fall and winter, a lot of attention is given to starchy root vegetables and meats, but fresh green veggies truly begin to peak in the early spring and shine on throughout the summer. Nowadays you can buy almost any fruit or vegetable at any point in the year, but you'll pay a hefty price for buying things out of season that are shipped in from warmer locales. It's also less likely to taste as good, in my opinion - think of the difference in buying a tomato in the dead of winter versus a fresh one in the summer. If you pay attention to the way your grocery store or farmer's market changes with the seasons (and you should) you will notice a shift towards the end of March and beginning of April as spring ushers in a bounty of fresh produce. You'll also notice the prices start to drop dramatically as more vegetables and fruits come into season. My challenge to you for this dish is to venture beyond the same old things you eat all year long and grab a variety of fresh, seasonal vegetables. To make things easier for yourself at the store, download an app or snag a produce availability chart from the web that highlights what's in season in your area. For my first taste of spring today, I picked up some snow peas, snow pea greens, asparagus and a ton of fresh herbs. I'm saving the snow peas for a stir fry, but I was really intrigued by the snow pea greens and decided to include them in my veggie bowl. 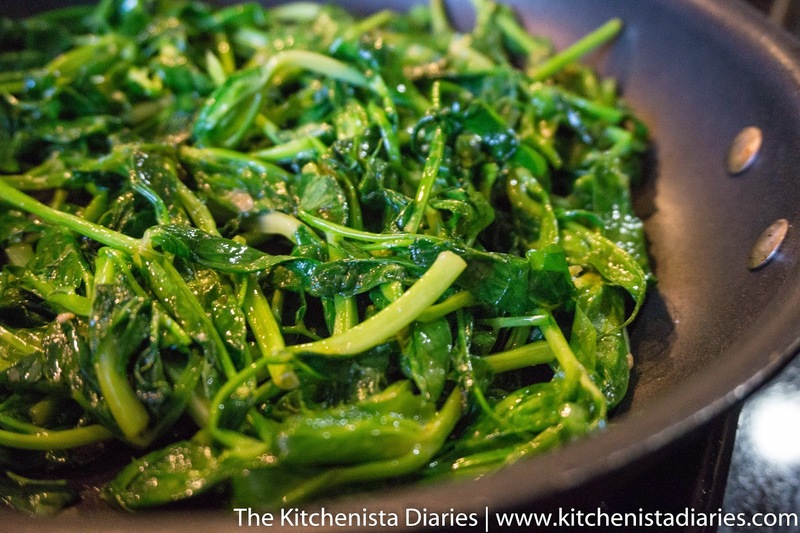 I'd never tried snow pea greens before but I'd read about them in a couple articles. It's always good to know that these things actually exist outside of the glossy pages of trendy food magazines! I'll get super excited next month when I can chase down some ramps... but more on that in April. At any rate, hunting down seasonal produce becomes a little game I play at the market which makes grocery shopping that much more fun. Yes, my food nerdiness is showing. As you can see, it's less about the recipe or specific measurements and more about balance. The goal is to get a variety of contrasting textures and flavors in each bowl. When each bite is different and interesting, you'll have more fun eating and that can translate to getting some healthier meals into your diet. Crunchy, creamy, sweet, spicy, nutty, tart, tender and earthy are all examples of textural and flavor components you might want to represent in your grain bowls - some veggies can hit more than one note. The protein you select might be meat, seafood or eggs, but you can also find vegetables that are high in protein, not to mention grains such as quinoa. 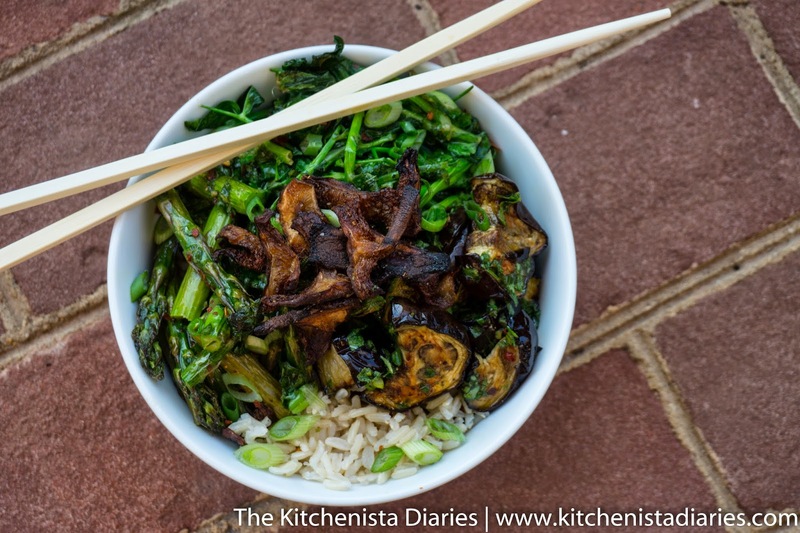 For my grain bowl today, I chose brown Jasmine rice, piled high with silky roasted eggplant, tender asparagus, grassy snow pea greens, and savory shiitake mushroom crisps. I used a mix of early spring produce and some staples that are available year round. A good sauce will also employ a tasty balance and is the part of the bowl that truly lends itself to creativity. I'm a food product junkie, but most of the formal entrees I cook need to be "recipe friendly" for blogging. When it comes to quick meals I make on the fly though, I love to make use of specialty ingredients such as those I get in my monthly Hatchery boxes. It's not uncommon to find a mess of salad dressings, chutneys, jams and spreads in my fridge, all stored in glass mason jars -- the remnants of that week's kitchen wizardry. I've found that sauces and vinaigrettes are a fantastic vehicle for infused oils and vinegars, and a great way to experiment with unique flavors in my grain bowl. For today's bowl, I used Wei Kitchen's Amber Vinegar and Shallot Oil to make a Vietnamese inspired dressing. 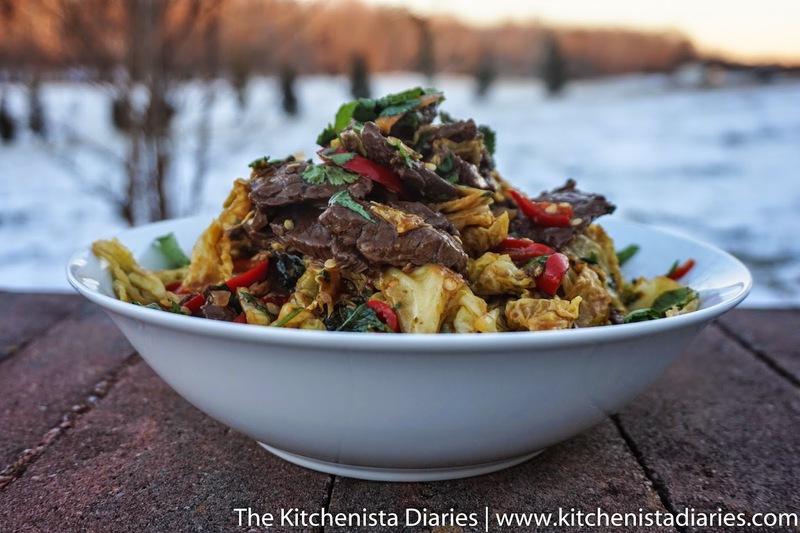 I first experimented with this dynamic duo when I received Hatchery's tasting box for January, using the oil and vinegar in a spicy stir fry sauce for cabbage and beef. In fact, it was my intention to share that recipe - but with the arrival of spring, I thought a lighter, fresher dish was in order. Hatchery describes Wei Kitchen's Amber Vinegar as "a sweet blend of organic rice wine vinegar, brown sugar, and anchovy extract—giving a wink and a nod to that classic Vietnamese fish sauce flavor, but on a much subtler level." As for the Shallot Oil, it is pure and straightforward, the essence of shallots beautifully infused into safflower oil. I adore shallots and use them almost as often as onions and garlic in my dishes. Let me tell you, I wanted to inhale this oil. 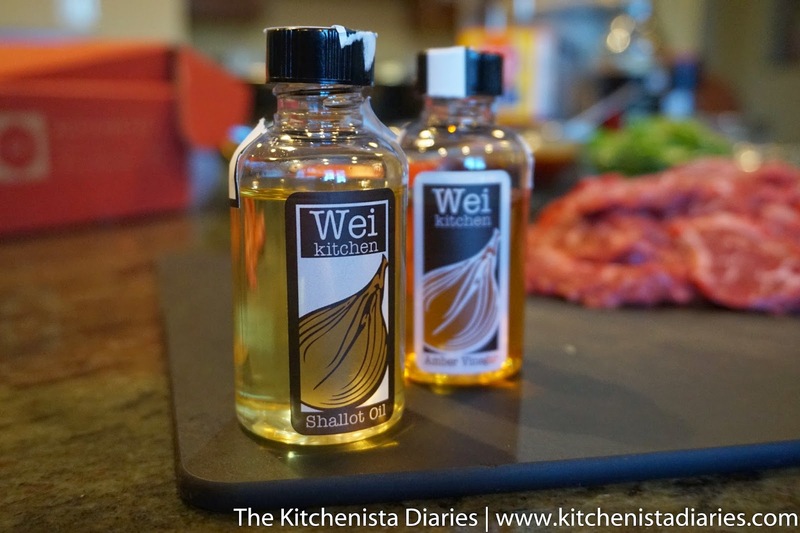 As noted on the site, the Shallot Oil blends well with other oils. 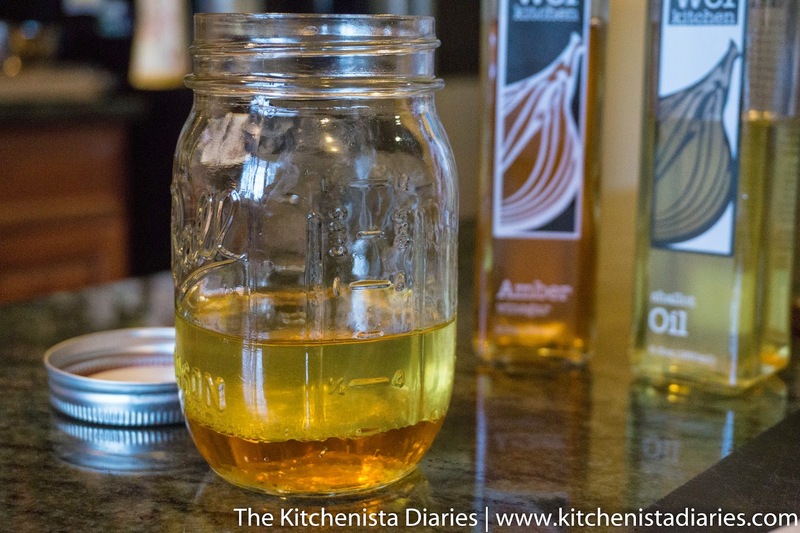 You'll notice in my vinaigrette recipe that I'm using half Shallot Oil and half grape seed oil. I also roasted and sauteed all of my veggies in grape seed oil. There's a couple reasons for that. Finishing oils like a good extra virgin olive oil, and some infused oils, like the Shallot Oil, tend to be rich enough in flavor that a little goes a long way. They are also more expensive than regular cooking oils. You need quite a bit of oil with all the veggies we're cooking, and you'd end up with a bowl that's too strongly flavored if you went overboard with Shallot Oil in every component. I don't know about you, but I want a chance to use my Shallot Oil in so many other dishes! I loved the Amber Vinegar and Shallot Oil together, but I'm also excited to use them separately and see how they shine in other cuisines. I hope my Veggie Grain Bowl guide inspires you to embrace the season in your next trip to the market. Goodbye, winter soups and stews... hello spring veggie bowls! Makes approx. 1 cup of vinaigrette; enough for 4 bowls. Leftovers keep well in a tightly sealed jar for a few days. No quantities are listed here, so prep/cook as much as you'll need for your own use. For each bowl, I'd recommend 1/2 cup of grains, 2 cups of mixed veggies, and up to 2 ounces of dressing as a healthy serving. *Prep/Cook times are estimates based on the vegetables you choose, and should only be a one time deal. The idea is to prep a large enough batch that you'll simply need to reheat cooked veggies after day one for the next bowl. If you're not used to meal prep, this might seem like a lot to do for one meal, but the beauty in the process is not having to do anymore work for the next couple of days afterwards. With a little bit of multitasking, it took me about an hour from start to finish prepping and cooking veggies and making the vinaigrette. First order of business was getting my brown rice cooking. I used brown Jasmine rice, which cooks in 20 minutes and needed no more than a couple pinches of salt. Follow the package directions for the grain you chose for best results. 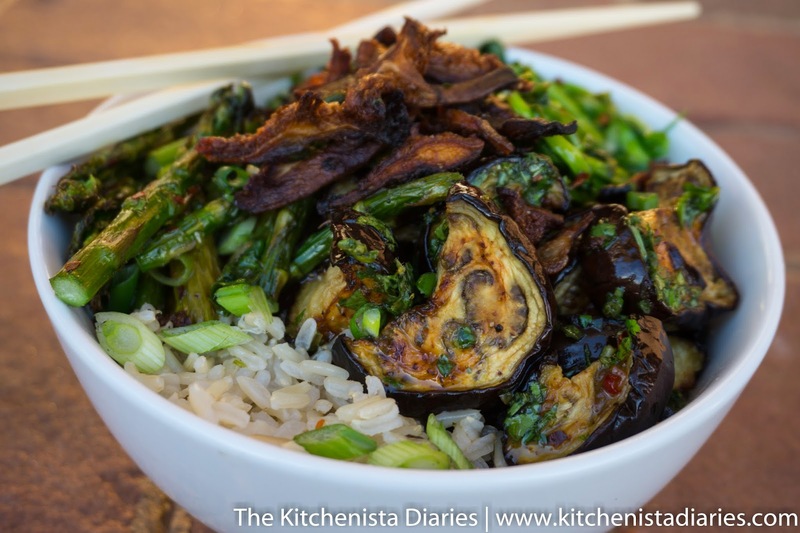 The next order of business was roasting my eggplant, asparagus and shiitake mushrooms. 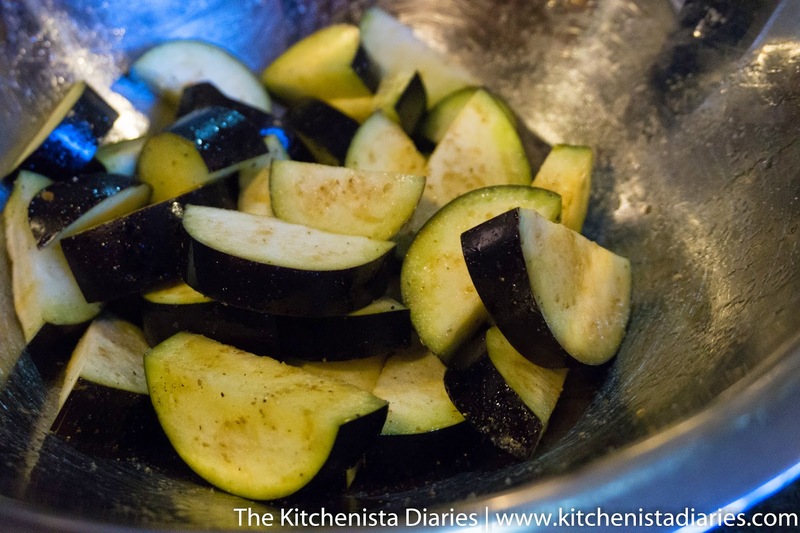 I sliced the eggplant into 1/2" thick moons, tossed it in grape seed oil to lightly coat, then seasoned with salt and pepper. I did the same with the sliced shiitake mushrooms (caps only, discard the stems) and arranged those on a heavy baking sheet lined with parchment paper. I also chopped my asparagus spears into 3" pieces, tossing them with oil and seasoning with salt and pepper. 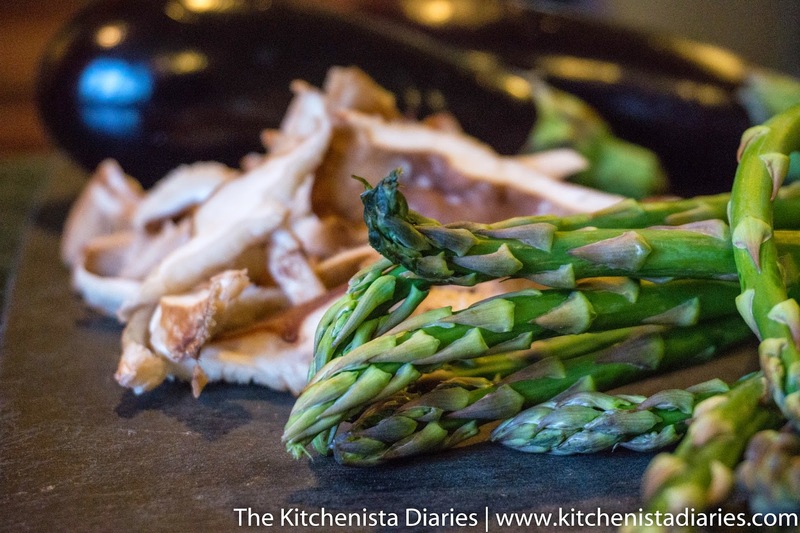 Those were set aside to add to my pan later because asparagus doesn't take long to cook. Yes, salt and pepper is all you really need here. The idea is keeping things well seasoned but neutral - that way you can use these roasted veggies in other dishes throughout the week. My oven was preheated to 400° F and a rack arranged in the upper third of the oven. The key to roasting more than one kind of veggie is timing. I cut the eggplant pieces to a size that would take about 30 minutes to roast at this temperature, and the mushrooms take the same amount of time. Asparagus takes half as long to cook, so I didn't add it yet. 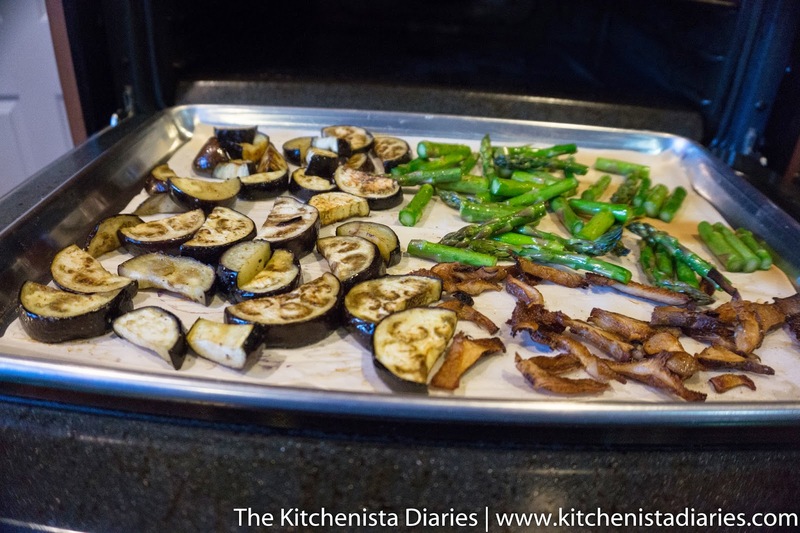 After 15 minutes, I flipped the eggplant over and added asparagus to my baking sheet. Thirty minutes later, all of my veggies were perfectly roasted. 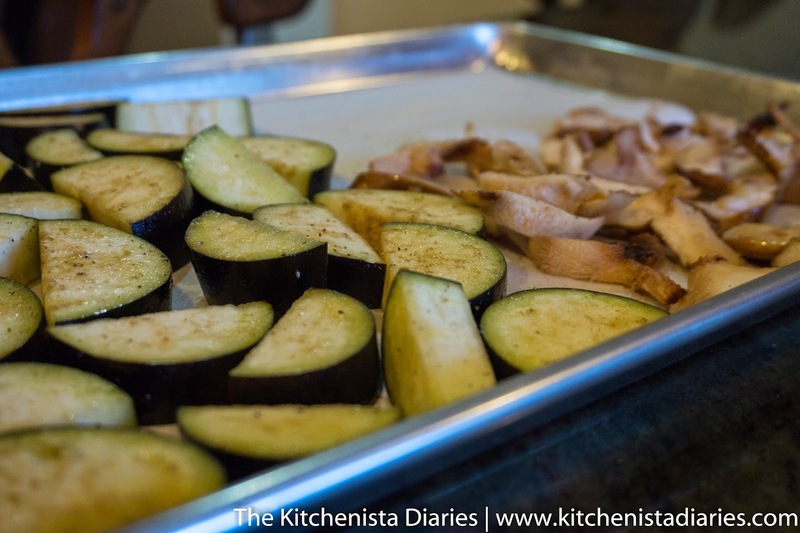 The eggplant gets crispy on the outside and creamy on the inside. 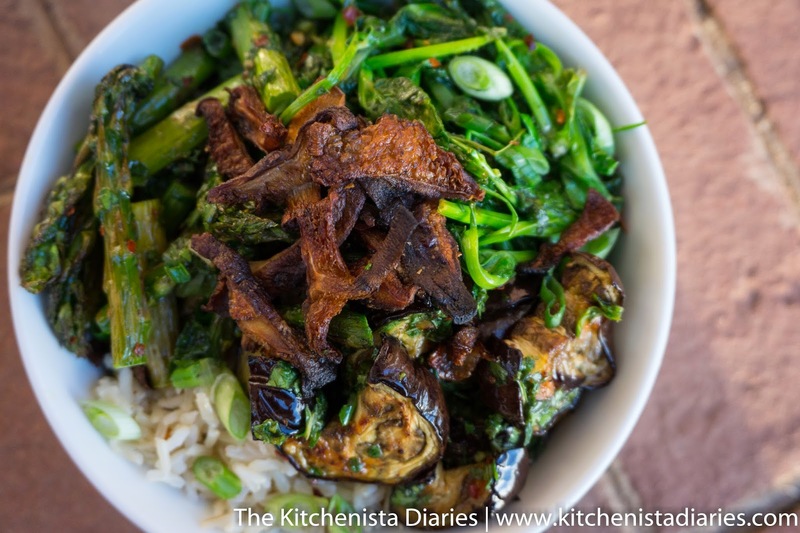 The asparagus becomes tender but still has some bite left to it, and the shiitake mushrooms shrivel into bacon-like crisps with intense umami flavor. 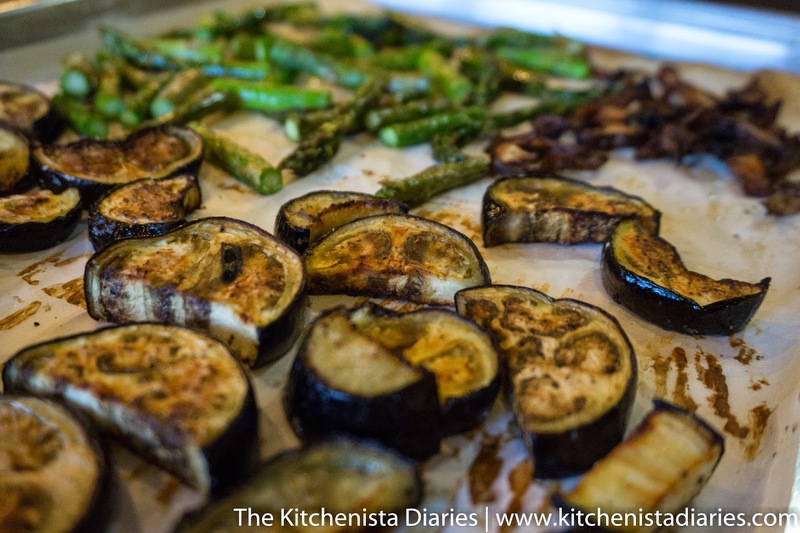 I was only making enough veggies for two bowls today, but you might want to do an entire sheet pan full of eggplant and a separate pan split with mushrooms and asparagus. You'll want to choose a green that is already tender and wilts quickly. 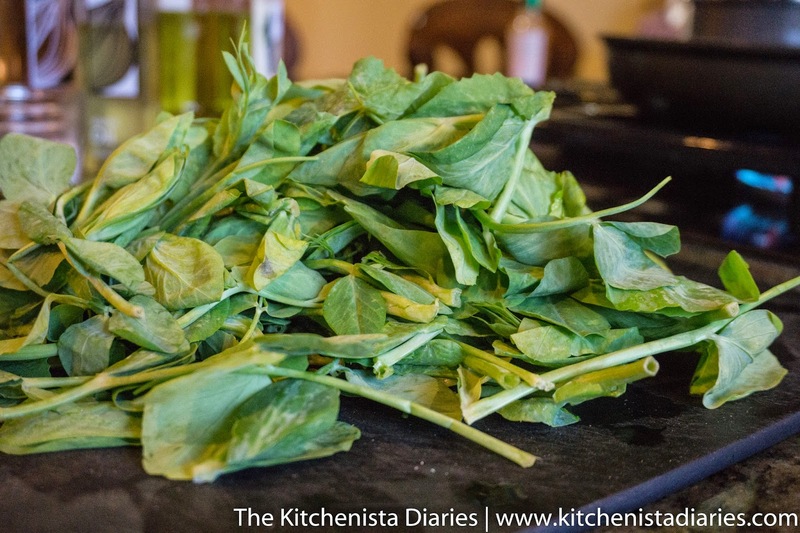 All I needed to do to my snow pea leaves after washing them was trim the curly ends off, and into a hot skillet they went with a bit of grape seed oil and salt. These were delicious, by the way, and flavorful on their own. Other than slicing some scallions for an optional garnish, that's all the prep work needed for the bowls themselves. It's really not a lot of work at all and everything cooks at the same time. Roasting veggies and cooking rice is hands off, freeing you to saute those greens, which takes all of 5 minutes. The last order of business is making the Vietnamese Vinaigrette. I'm a big fan of using mason jars for dressings, because you can shake them up and store it all in the same container, less mess. To start, measure out your oil and vinegar. You can eye ball it or use the jar's measuring guides. 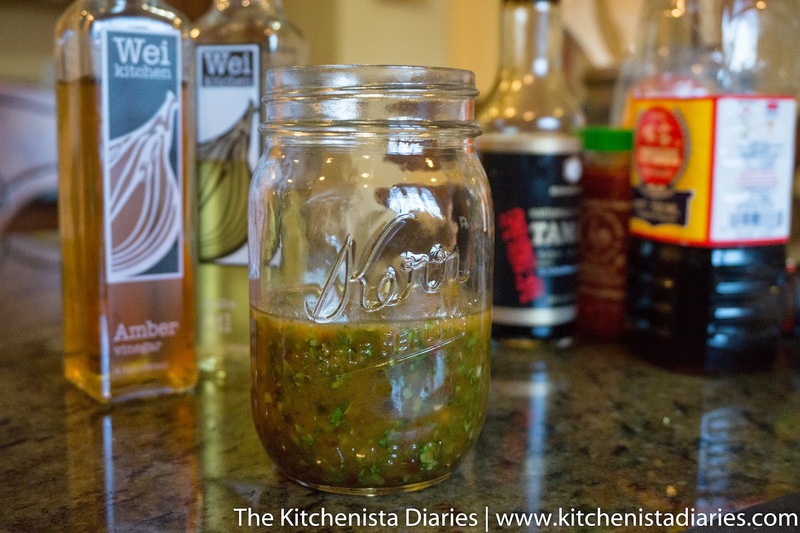 Add all of the other vinaigrette ingredients and adjust the sweet, spicy, salty and sour elements to your tastes. As a hint, if you can't taste the herbs well enough, you're usually a little short on salt. The flavors will also be more pronounced after they sit for a little bit. Asian food is one of the best examples of balancing flavors so it's fun to practice with things like this that require you to taste your food and recognize what needs to be tweaked! When you're ready to assemble your veggie grain bowls, add your rice to the bottom of the bowl. 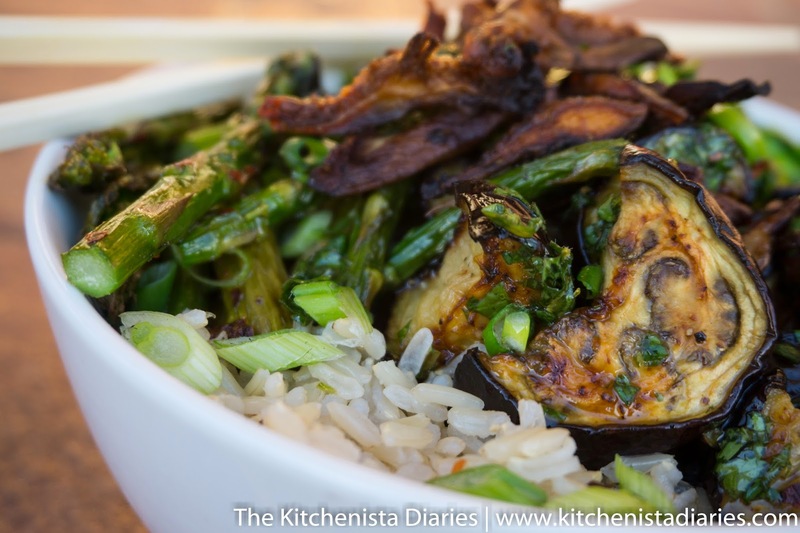 Then you can top it with a bit of each of the cooked veggies - roasted eggplant, asparagus and sauteed greens. 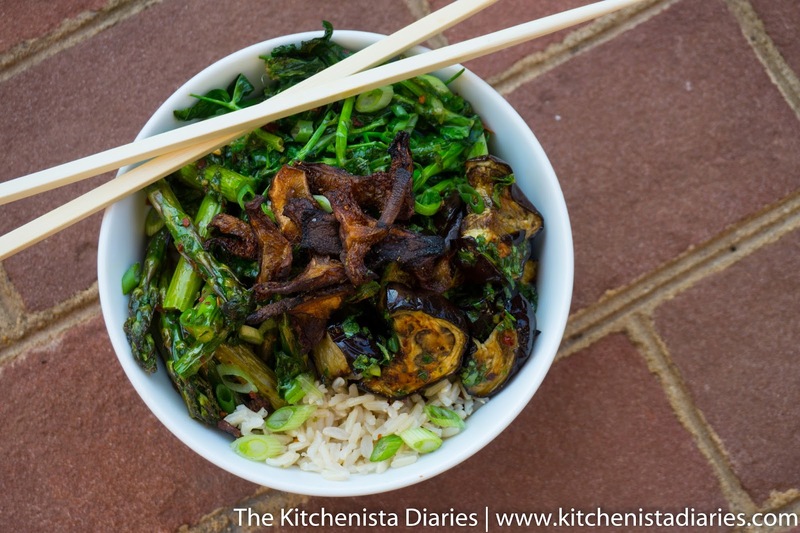 Drizzle with the Vietnamese Vinaigrette, then top with crispy shiitake mushrooms and green scallions to garnish. Even without any meat, this really hit the spot for me and was exactly what my body was craving. I can't wait to start making these more often as the produce selection continues to expand this spring! 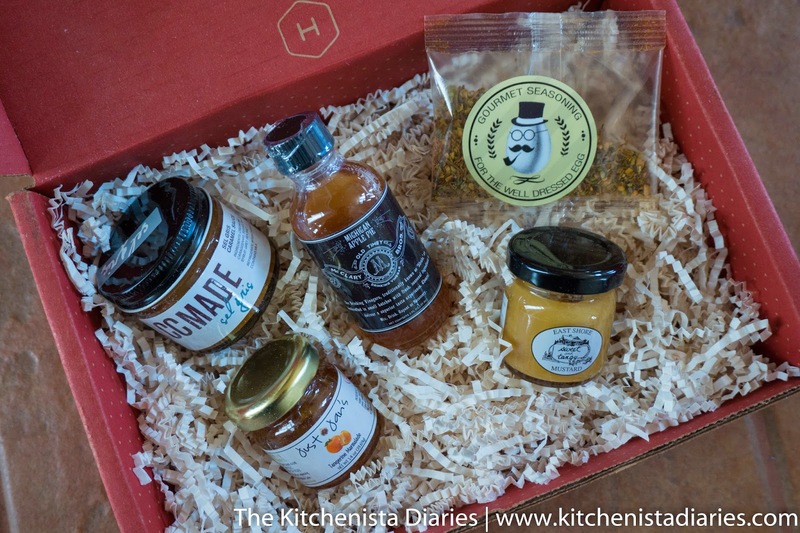 Be sure to check out my other featured Hatchery recipes and get some inspiration for ways to use your next tasting box!